Council chambers in South Taranaki are hearing evidence on the dangers of its “unusually relaxed” Proposed District Plan, which allows for the production of oil and gas within 200-metres of sensitive areas like houses, schools and hospitals. At the hearing today, expert witnesses are outlining the risks associated with the Proposed District Plan (PDP), saying a buffer zone of just a couple of hundred metres is not enough. Community group, Taranaki Energy Watch, is leading the PDP case and has brought experts together from across Australia and New Zealand. Sarah Roberts, the group’s spokesperson, says today’s hearing will have implications for the rest of the country. “If these rules pass muster in South Taranaki, the Stratford and New Plymouth District Council is poised to roll out similar rules. There’s also a possibility the Minister of the Environment will enact comparable rules nationally,” she says. Jenny Polich, an international industry explosion expert with over 15 years’ experience in safety and risk management, says South Taranaki’s proposed regulations don’t account for the potential risks associated with oil and gas activities. “They are unusually relaxed and will not provide adequate protection from a well blow out or an explosion in a production facility,” she says. 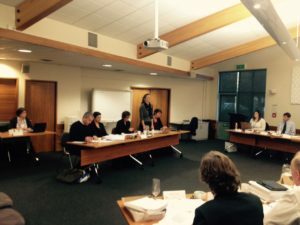 The hearing also heard from Senior Air Quality Specialist, Louise Wickham, who has worked extensively for the Ministry of Health and Ministry for the Environment in New Zealand. She says that oil and gas activities emit a large number of toxic and carcinogenic pollutants to air. “In light of the seriousness of the adverse health effects caused by and associated with these pollutants, I recommended sensible separation distances from sensitive areas, such as home, schools, and hospitals,” she says. There are concerns that the PDP also defers much of the responsibility to manage the health and safety of oil and gas in South Taranaki to Worksafe. Legal Counsel Ruby Haazen says this simply isn’t acceptable. The RMA clearly states that it’s the territorial authorities’ responsibility to enable the wellbeing, health and safety of people and communities, and must manage the effects of industry such as oil and gas, she says.